Home»Blog»Backup News»Our new BackWPup website is online! Since today, our new BackWPup website is online! Yeeeaaah! 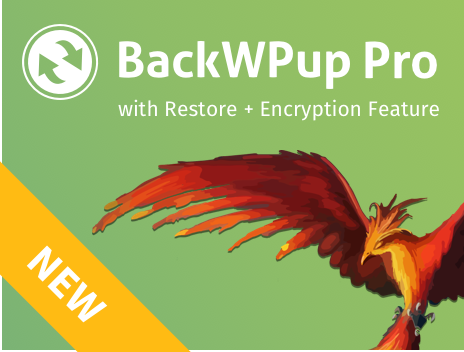 Here you can find all relevant information about our successfull and popular WordPress Backup Plugin BackWPup. More in depth information, FAQ and documentation can be found here. The documentation and FAQ page gets updated regularly to meet our high requirements of our premium support and that we can be sure, our users are very happy with our service and performance. We hope you will like the new website! We are looking forward receiving contructive feedback, hint of founded errors and positive comments! Until June 20th, get 30% rebate on BackWPup. We celebrate the milestone of 3 million downloads! A big thanks to all our users! Until June 19th, you can win 12 tickets for WordCamp Europe in Vienna! We have a survey running about the new restore functionality, which will be implemented in BackWPup Premium soon. Participate and win a license! You can find the German website of the WordPress Backup Plugin BackWPup here. Also our multilingual plugin MultilingualPress has a new website. There you can find all information about the perfect multilingual solution for WordPress.